Dance floor tape is crucial for the temporary installation of dance floors. It holds the seams together and keeps the edges firmly fixed to the floor. 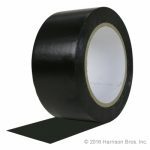 While dance floor tape is necessary to manage a dance floor, it’s not a very big deal in the tape universe. The total use is minuscule, compared to other applications for smooth vinyl tape. Manufacturers sometimes “brand” this generic product with the name of a famous dance floor and price it 3 times what it would otherwise cost. They convince dance floor owners that only their brand of tape works and then overcharge every time the floor is reinstalled. Our competition sells an identical tape for more than twice the price per roll of ours. You can buy two rolls of our dance floor tape for less than one roll of theirs and still have 32 cents left over. Instead of buying a brand name tape, search instead for “Solid SPVC Vinyl Tape”. That’s the real name for this splicing tape. It has hundreds of uses in construction, materials management, vehicle striping, lane marking and color coding. Dancers call it “splicing tape”. The seam of tape used to bridge the gap between two separate sections of vinyl dance floor is called a “splice”. This splice holds firmly so the floor won’t shift as the dancers feet move across the dancing surface. Splice the sections of the dance floor together and leave a gap of about 1/8 inch between the sections so the floor won’t push against an adjacent section as it expands with heat. A 6 mil thick SPVC tape has the same specifications as name brand dance floor tape. It is an easy way to save lots of money.